Exploring the National Parks System on it’s 100th Birthday, Aug 25th 2016. It is in the woods that I find peace and my spirit is rejuvenated. It is in the forest of my beloved West Virginia that I rejoice that we live in a country that values and protects the most unusual of our natural resources. It is in our countries wisdom that they have saved millions of acres of land and miles of waterways for future generations. 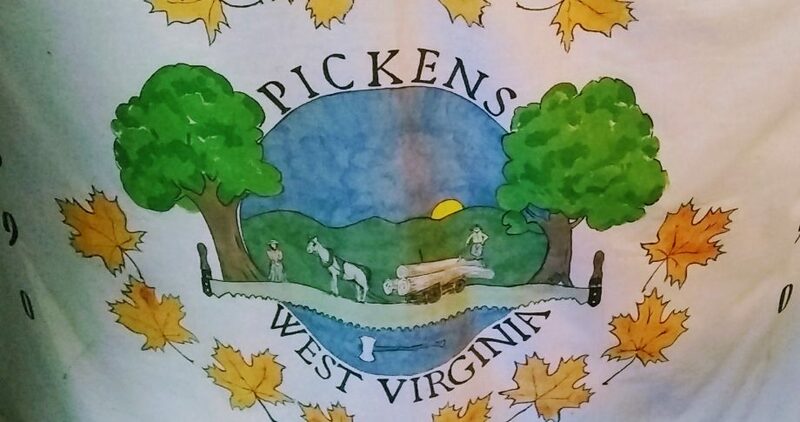 West Virginia is one of the states that does not have a fully designated National Park. So for this August 25th celebration I want to share a vision of one of my states protected National Forests, Monongahela National Forest. This unique forest ecosystem is preserved at the national level within the National Park System along with West Virginia’s National Rivers, The New River,and Blue Stone, Two National Recreation Areas,The Gauley River National Recreation Area and Seneca Rocks National Recreation Area, a National Historic Park at Harper’s Ferry and of course a National Scenic Trail the Appalachian Trail. All of these locations are protected for future generations buy the National Parks System of the United States of America. The Monongahela National forest represents a wide verity of rare and unique ecosystems, natural wonders, beautiful vegetation, and abundant wild life. It is here within the forest that my family and I have spent hundreds of hours exploring, searching for that rare moment when the outside world disappears and nothing remains but the sights, sounds and smells of nature. This National Forest comprises roughly a million acres of forest land in West Virginia. An approximate 1.3 million visitors come to the Monongahela National Forest each year.The forest spreads across the Southern portion of the state from the city of White Sulfur Springs to the Northern border of West Virginia to Maryland state line. With the main body of the forest residing on the Eastern side of the state, along US Highway 219. Within West Virginia’s largest National Forest there is a long list of natural wonders. Some I have photographed over the years and others are still a mystery to me. Some are easy to access and others are miles from civilization. So with the help of my family I have had the pleasure of seeing much of the forest and can share just a few of the wonderful sights that I have explored over the years. Stuarts Park campground, picnic area. Stuarts Park has several CCC built covered pavilions with in the Monongahela National Forest. Also located within a mile of the campground/ park pavilions is Bickel Knob Observation Tower where it is possible to see about 1/3 of the National Forest and the surrounding towns. The trip up this tower early in the morning lets us see over six different ridge tops and two small towns. 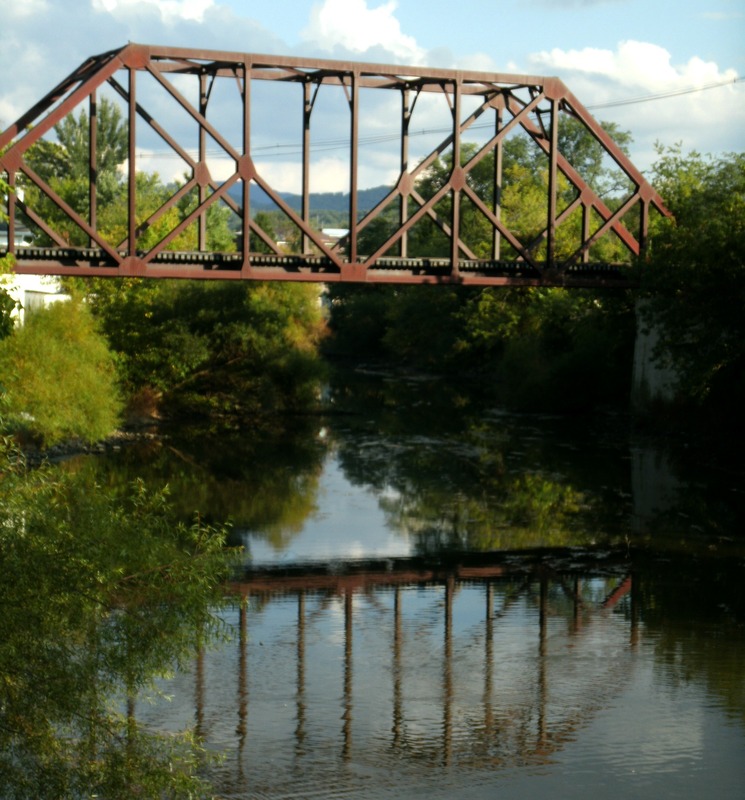 The Bowden Fish Hatchery is where the local brook trout, brown trout and the West Virginia Golden Trout are brooded for release all over the state. We fish in the many streams and rivers in the forest. My son learns to cast at Shavers Fork of the Cheat River. Exploring Smoke Hole Caverns on a hot summer afternoon is a treat.To spend a couple of hours under ground exploring the caves is one of my families favorite summer time trips. All of these amazing locations are within the National Forest but what I am most fond of is the simple quiet beauty that we see as we forage and hike through the woods. Cheat Mountain Salamander takes visitors on rides through hundreds of miles of the Monongahela National Forest. This is my favorite way to see the sights. This train ride is headed for Green Bank and the National Radio Observatory where in the middle of the Monongahela Forest is the darkest place in West Virginia. It is the perfect location for star-gazing with professional astronomers. This is where my family and I finally got to see the Milky Way with our bare eyes. As you can see I love my state, love my Forest and am excited to be included in this centennial celebration. Thanks to Cotopaxi Company for inviting me to take part in the festivities in my small way. I am proud to share with all of you the great work that Cotopaxi is doing all around our world and how one company with a mission can change the world one backpack at a time. I am so glad that their company supports and loves the outdoors as much a I do. Thanks for reminding us all about how important our Nation Park System is and what would be lost without our ability to explore and enjoy to great outdoors. Again Thank you Cotopaxi for letting me join in the fun! A Night Train to the Stars. One of the best things about West Virginia is the amount of wilderness, meaning fewer people and less civilization. 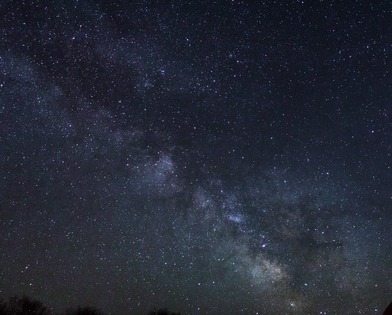 Making West Virginia a perfect place to do star-gazing, and Radio Astronomy. 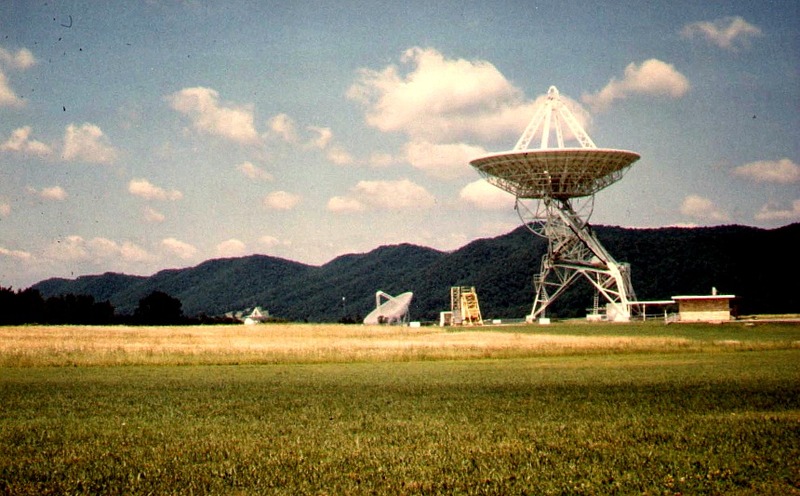 Hard to believe that hidden in the woods of West Virginia at Green Bank is The National Radio Astronomy Observatory. These are the type of telescopes that inspired the movie ” Contact” with Jodie Foster. Where the Astronomers are listening to the world of outer space. At Green Bank they also encourage visitors to enjoy their reflective telescopes to see all wonders of our galaxy. So when my son said he wanted to plan his 6th birthday around trains, camp fires and the stars how could I say no. One of the offerings that Astronomers from Green Bank give to visitors is the option to do a Star Gazing event once every year on their property that is only accessible by train. No high way, no logging road, no hiking trails on the 13,000 square miles of US Government land. 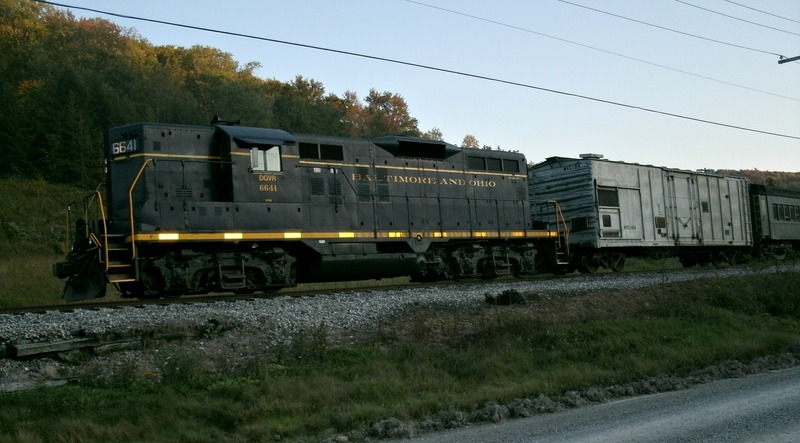 Access is just a historic railroad track built about 2 century’s ago to transport coal from the high lands of Pocahontas County to the lower flat land of the Ohio Valley. 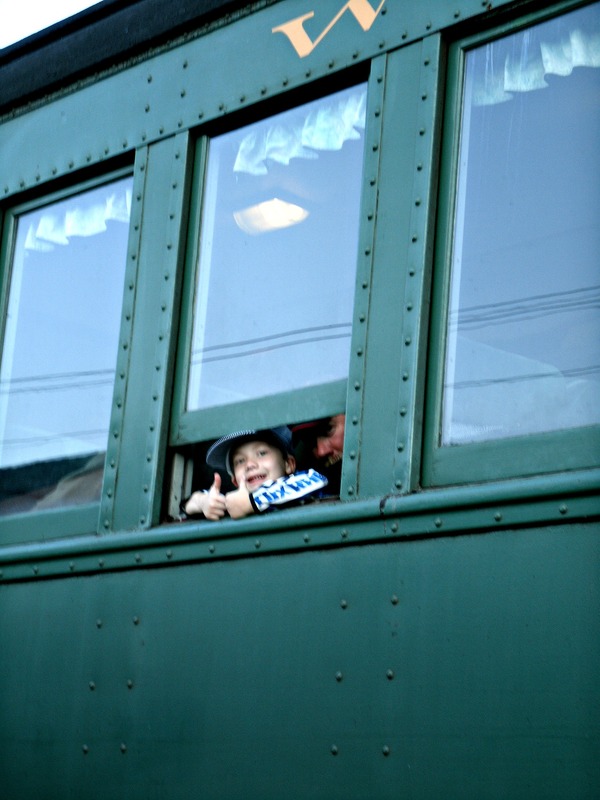 The idea for a short ride on a local tourist train was a perfect way to transport visitors to the remote location to take photos, learn more about Astronomy and ride into the past on a restored diesel train and cars. Add in the fact that they allow you to have a camp fire and roast marsh mellows you have a great time planed for everyone who takes the night train to the stars. As this was Christopher’s birthday adventure we made an afternoon and evening out of the trip. 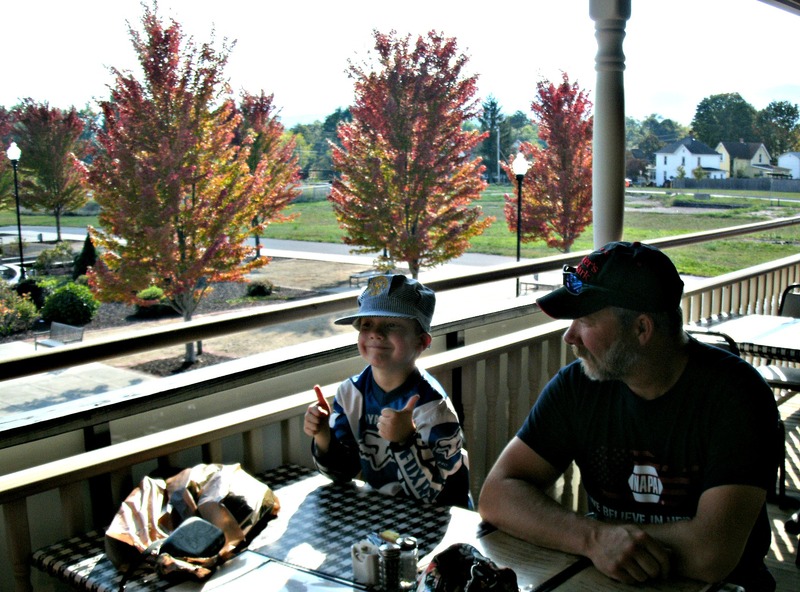 We started our train themed fun in Elkins, West Virginia at The Depot Restaurant that uses train themed photos and paintings as the decor. All while being able to walk the grounds of a fully functional and restored 1800’s Depot. 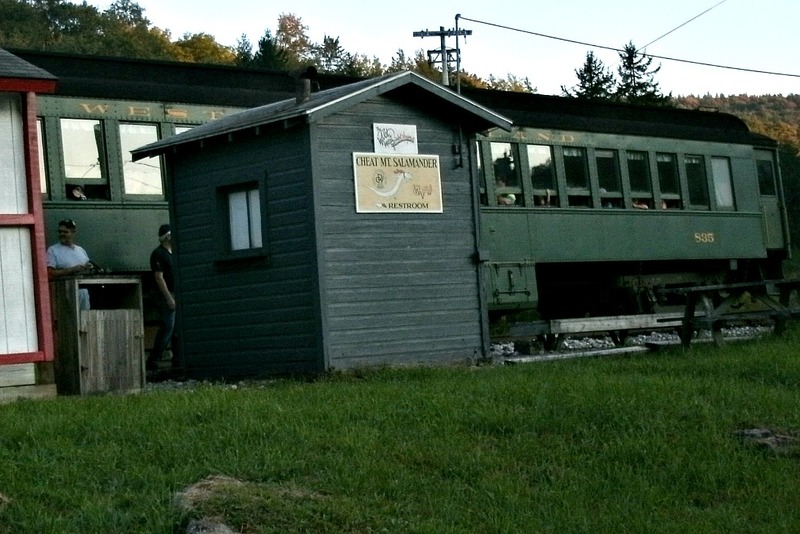 This is also the main office for the Cheat Mountain Salamander, the New Tygart Flyer, Mountain Explorer trains. For more information about the trains and their trips Contact www.Mtn-Rail.com. The grounds around the Depot showcase a traditional turn table and tussle style bridge that leads to loading dock of the Depot. 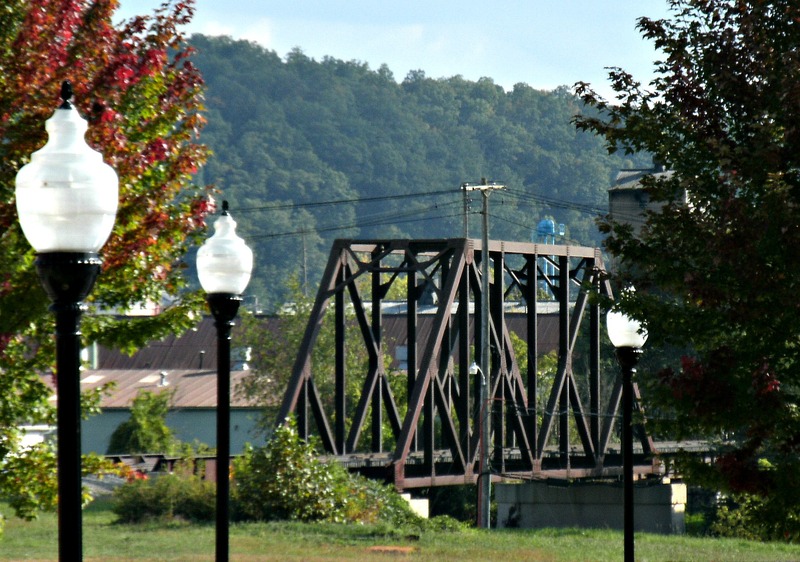 view of train bridge from The Depot Restaurant. After a nice walk to the bridge and the river we shopped some at Delmonte Market across the street from the depot.We found a large selection of hand-made and country themed gifts and toys. This was one of the hand-made items in the beautiful store. 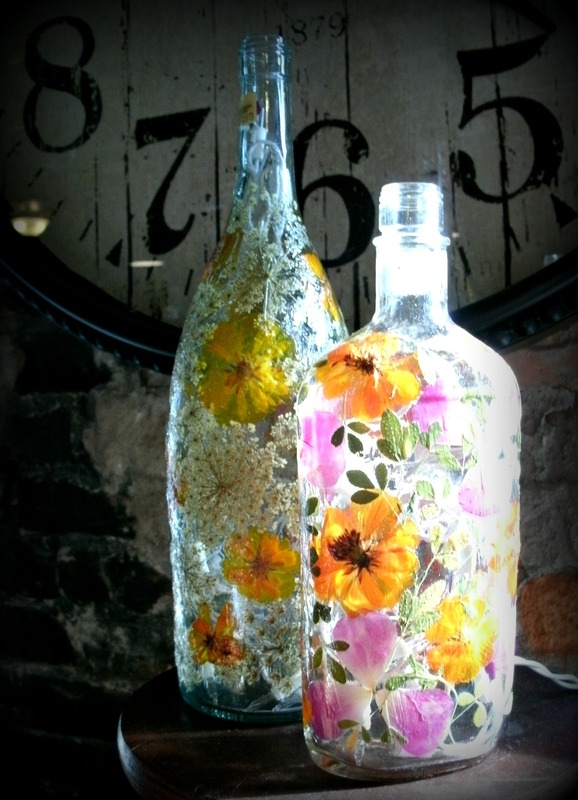 Recycled bottles with Decoupage flowers and lights what a nice way to use dried flowers. After the shopping we headed south on Rout 250 to Huntonsville then through two very small towns to the Monongahela National Forest to the Cheat River Bridge where we found our loading area and started the evening ride up to Linen WV. We then rode the train for about 45 minutes to a small dirt landing. We disembarked the train and walked up into a field that surrounded us on 3 sides with nothing but trees. A fire was lit, roasting sticks for marsh mellows gathered and the sun began to set as the Astronomers set up their equipment. 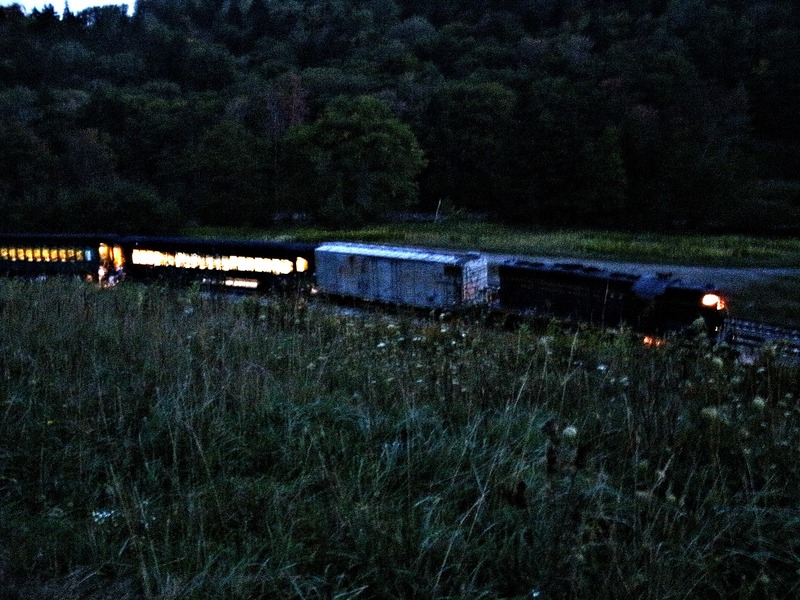 While we waited for the sun to set I got this last photo of our train before it disappeared into total darkness. by 8:30 pm we were in total darkness and this is what the train looked like. What happened next was astonishing, I have always loved the night sky, moon and the many planets, but I was not prepared for what I was about to see. The limited light from a moonless sky was enough to move around comfortably with out walking into anyone and the telescopes had small red lights to help us locate them in the field. I was just amazed that in total darkness the stars were soooo bright! I do not have the words to really describe what it was that we were able to see. From tree-lined horizon to horizon there was nothing to block our view, no lights were visible in our valley meadow. The only light was from the stars themselves because we had arrived here on the New Moon making it easy to see the most distant stars with out aide. As Tom and I found a spot for our folding chairs with our backs to the restored train landing we both looked up to the Northern sky to see the slowly dotted sky fill with a cloudy dust of the Milky Way. Each individual star suspended in space, slowly became two than ten than twelve hundred. The numbers and colors slowly expanded into the ribbon of the Milky Way from one horizon to another. This river of clustered stars outshone almost every star in the sky. With Millions if not billions of tiny lights glimmering it is impossible to not feel alone and part of a larger whole all at once. The big planets shown with the red-orange of Mars and the cold blue of Vega. The constellations blinked in perfect form, each one leading the eye from one white pin point to another until you discovered that you were looking at the opposite horizon watching Scorpio slowly descend below a wall of trees. We sat in total darkness for 2 hours barely speaking and those that did speak whispered as if to use an adult tone would somehow effect the reverence for the stars. We took turns looking into the telescopes and watching the Astronomers point out constellations with a laser pointer. Yet, every time we returned to our seats to enjoy the smell of a smoldering camp fire and the billions of bright white stars in the sky, we felt nothing but Peace. It was the most enjoyable two hours I have had in years. This time in the woods reminded me of the years that Tom and I would set up a camp site in the back yard to our older son Cody.We let him camp in our pasture behind the house on a hill. It was fun for me to lie on my back and look at the stars with him when he was 8 or 9. We shared a moment of happiness at its most simple. This trip expanded this feeling of happiness to something deeper and larger. It was very moving and fueled my interest in astronomy again. As families and scientists prepared to re-board the train the temperature had dropped to 45 degrees. The air was cold and we could all see our breath but no one complained. We filed to our seats for the short 45 minutes back down the mountain and no one raised their voices. We spent the time laughing with strangers and reminiscing as if we are all long-lost friends… We were all happy, including the sleepy birthday boy.